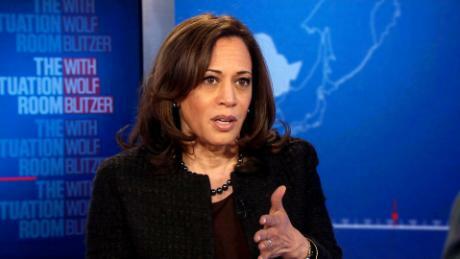 Presidential hopeful Sen. Kamala Harris said Tuesday that the Trump administration is "playing politics, yet again" with the Affordable Care Act, calling it the "height of irresponsibility." The California Democrat told CNN's Wolf Blitzer on "The Situation Room" that "the idea that we would turn the clock back because of some political purpose instead of prioritizing public health is irresponsible," and added, "We're going to have to fight against it again." Harris joins other 2020 Democrats in slamming the move by the administration and rallying around the Affordable Care Act. The senator said health care is an issue that "keeps most Americans up at night, regardless of who they vote for," as they worry about whether they can afford it. She said that "tens of millions of Americans have benefited from the Affordable Care Act, including the removal of pre-existing conditions as a barrier to receive care." "We have been clear, I think, as a nation that we value and we want all Americans to be able to have access to affordable health care, period," Harris said. "The idea that people are playing politics, yet again, with the Affordable Care Act is the height of irresponsibility," Harris said.